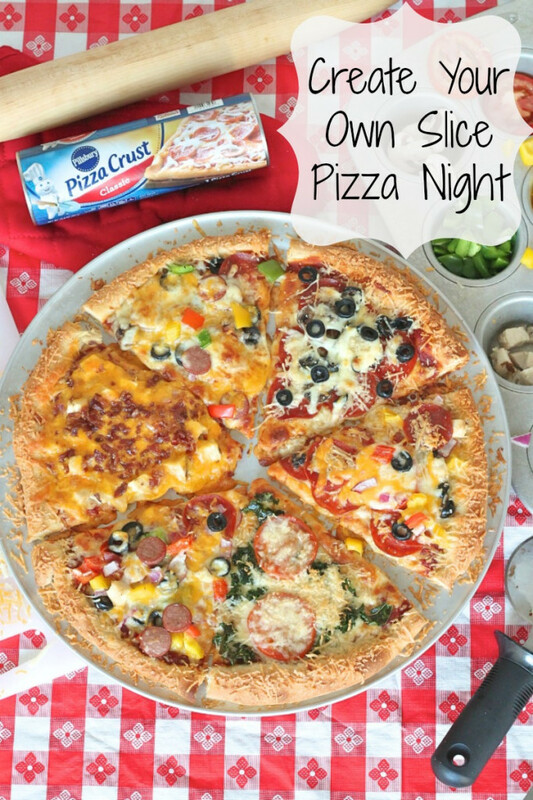 Bring the family together for a little “create your own slice” pizza night. A fun and tasty tradition the whole family will enjoy! We LOVE pizza! Like could eat it for every meal kind of love! The options are endless and pizza is pleasing to pretty much everyone! 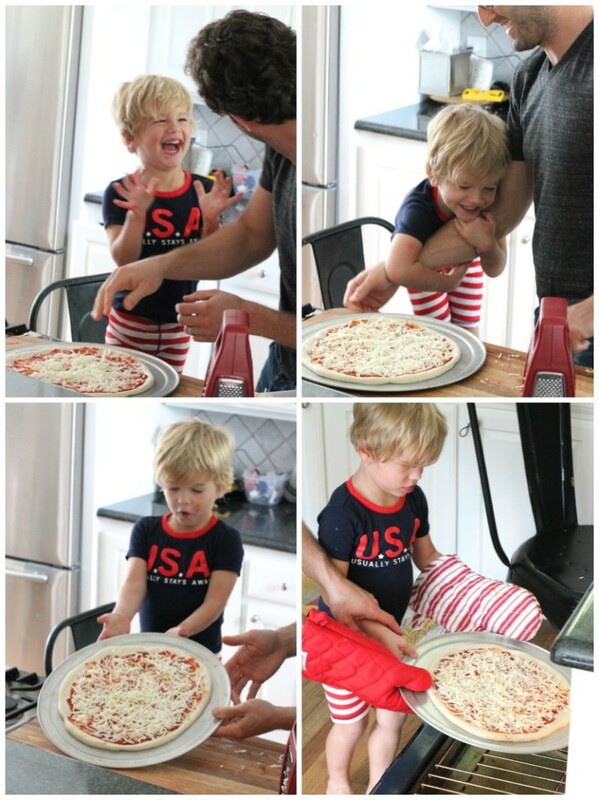 Pizza night is one of our favorite ways to spend an evening as a family. We put on our pajamas, pick out a fun movie, and pop a pizza in the oven. We usually do it on a Friday night after a long week of work and play. It’s a great way to wind down and ring in the weekend together. Nobody ever complains about eating pizza, but there are definitely differences when it comes to everyone’s favorite toppings. Someone wants cheese only, another wants just pepperoni, I like a few veggies on there, and Brandon’s all about the meats. 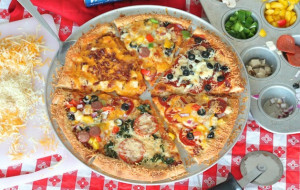 So instead of making five different pizzas, I came up with the idea to partially bake a large cheese pizza, cut it into slices, and let everyone create their own slice with their favorite toppings before we put all the slices back together to bake it into a yummy masterpiece that we created together. We’re always so proud when it comes out of the oven and we all get so excited as we search for our slice(s)! 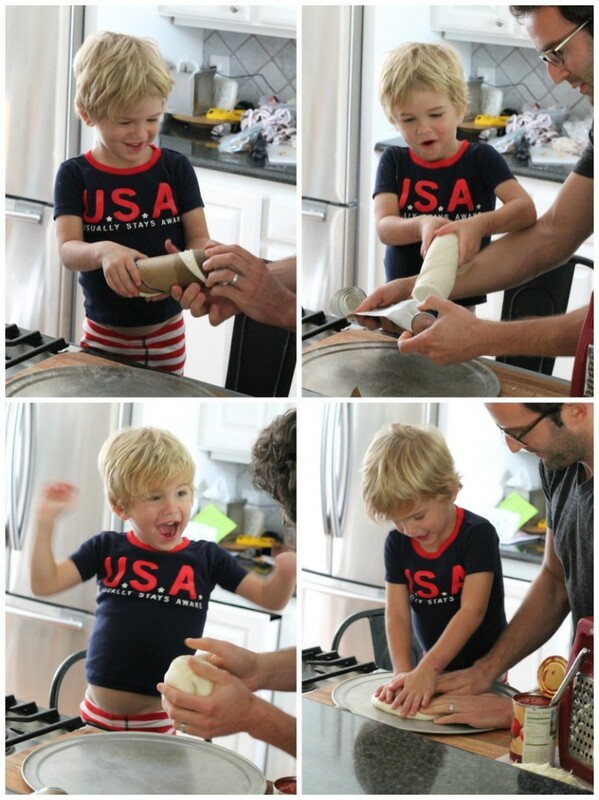 This little idea has transformed pizza night into an activity that’s exciting and enjoyable for all of us! If you follow us, you know that Brandon is pretty passionate about his pizza. From Neapolitan to New York Style, he’s put many a hours and love into creating the perfect crust. His pizzas are absolutely amazing, but they’re also time consuming and requires 3-5 days for the dough to rise, so we really have to plan ahead. Therefore, we save his “fancy” crust for dinner parties or date nights in. 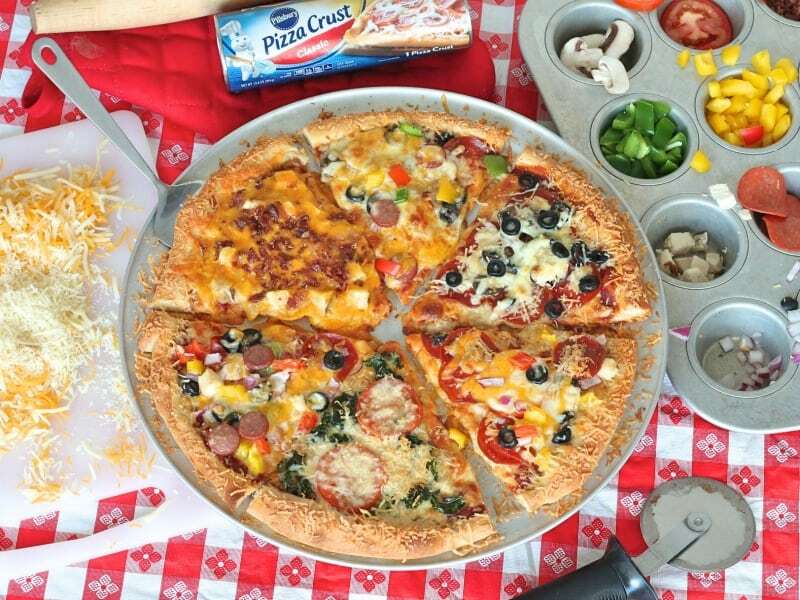 When it comes to family pizza night, when we need a crust that’s quick and delicious, Pillsbury’s Classic Pizza Crust is the way we go! 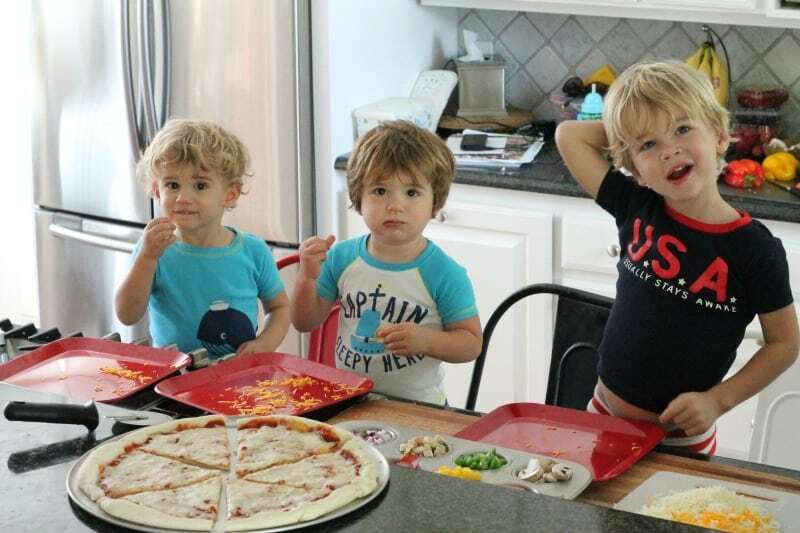 Bakerman and Dada usually get the crust in the oven, while the twins run around yelling “pizza! pizza!” and I prep all the tasty toppings. Sure, it can get a little loud & crazy, but it’s tons of fun! 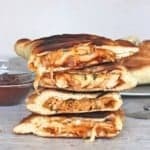 We start by forming the dough into a large circle on a baking pan and then spread it with a little pizza sauce and a generous sprinkle of shredded mozzarella cheese. 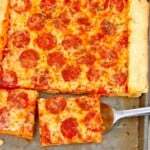 A quick 10 minutes in the oven gets the crust a little baked and the cheese a little melted. Just enough to be able to cut it into slices so each person can create their own slice. I put out a variety of everyone’s favorite toppings in a 12-cup muffin pan so that it can easily be passed from one person to the next. I also set out a variety of shredded cheeses for us to choose from. The boys get really into this. Sure, they stuff some of the toppings into their mouths and some (okay, a lot!) end up all over the floor, but our little kitchen is filled with so much excitement and laughter, which makes the mess so worth the memories! Once everyone’s finished topping their slice(s), we put them all back together on the pizza pan to make the pizza whole again. I like to brush the outer crust with a little melted butter and sprinkle it with some grated Parmesan cheese for extra yumminess. Bake for about 20 more minutes or until all of the toppings are cooked and the cheese is bubbling. By the time we all settle in at the table, the pizza is ready to serve up. 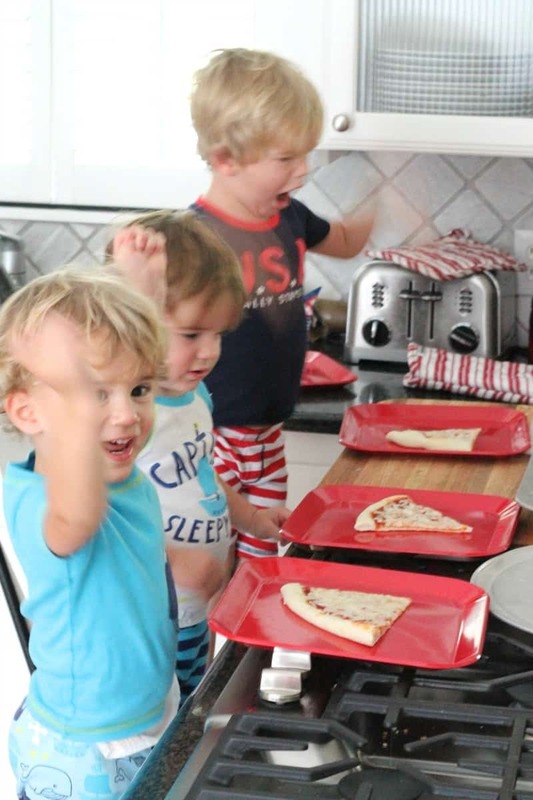 We let each of the boys take the spatula and pick up “their” slice to put on their plates. Smiles of satisfaction all around! 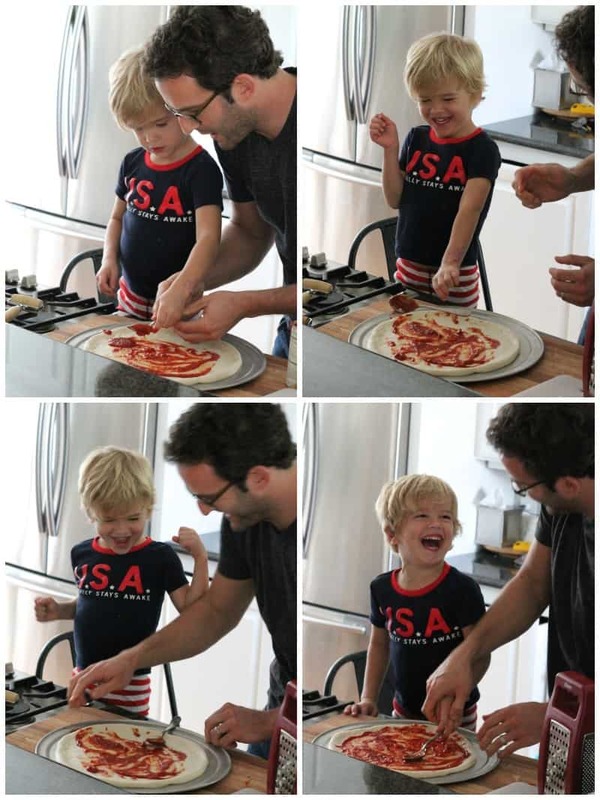 Make pizza night great for everyone! Enjoy! 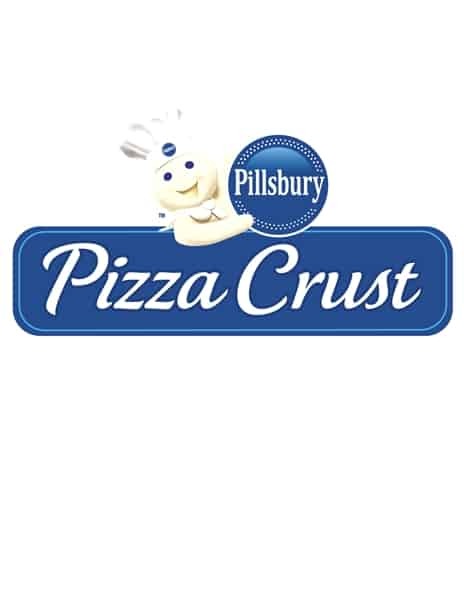 I’m so glad Pillsbury asked us to share our pizza night tradition and hope that you’ll find it as fun and memorable as we do! 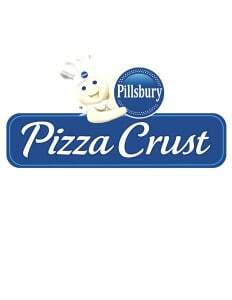 For more great pizza night recipes and ideas, be sure to check out the Pillsbury Pizza Site. If you’re looking for easy, creative and delicious food, be sure to follow Pillsbury on Facebook, Twitter, Instagram, YouTube or Pinterest They’ll provide you with tons of great how-to recipes, videos, and tips. 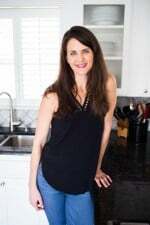 This recipe was created as part of my partnership with Pillsbury, however thoughts and opinions are certainly my own! 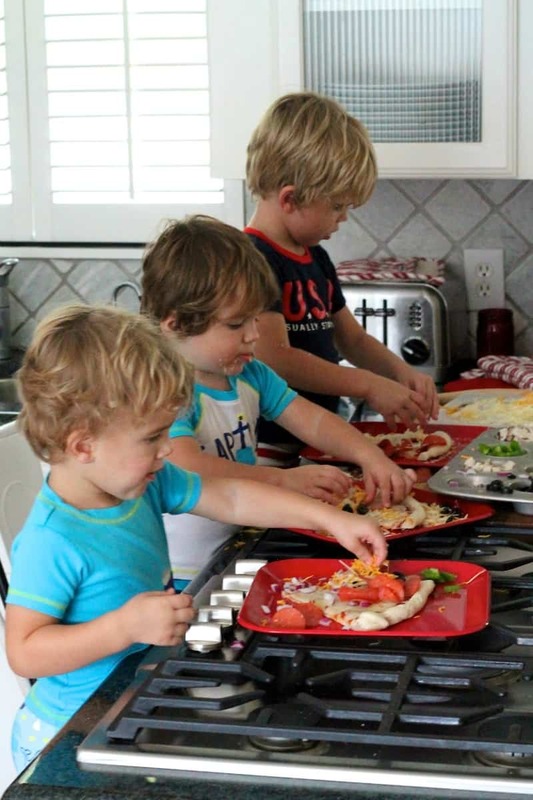 Bring the family together for a little "create your own slice" pizza night. A fun and tasty tradition the whole family will enjoy! 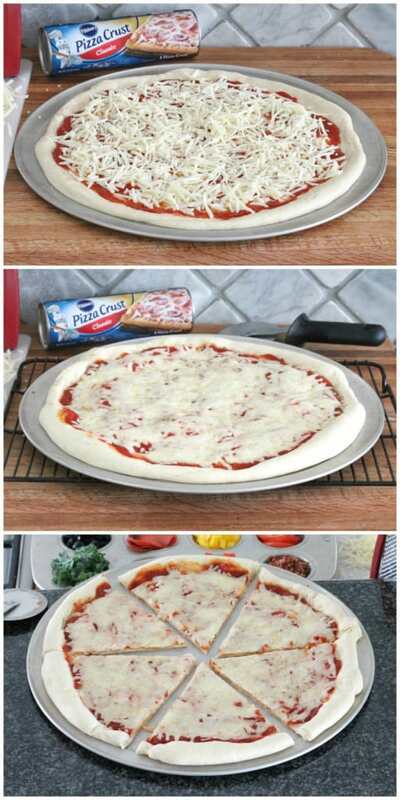 Shape dough into a large round circle on a lightly greased pizza pan or baking sheet. 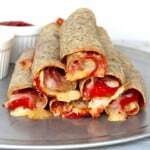 Spread with ½ cup pizza sauce and sprinkle with 1 cup shredded mozzarella cheese. Bake for about 10 minutes or until the edge of the crust starts to turn a light brown. Remove from oven and let rest for about 5 minutes before cutting it into 6 large slices. Meanwhile, prepare all of the toppings. 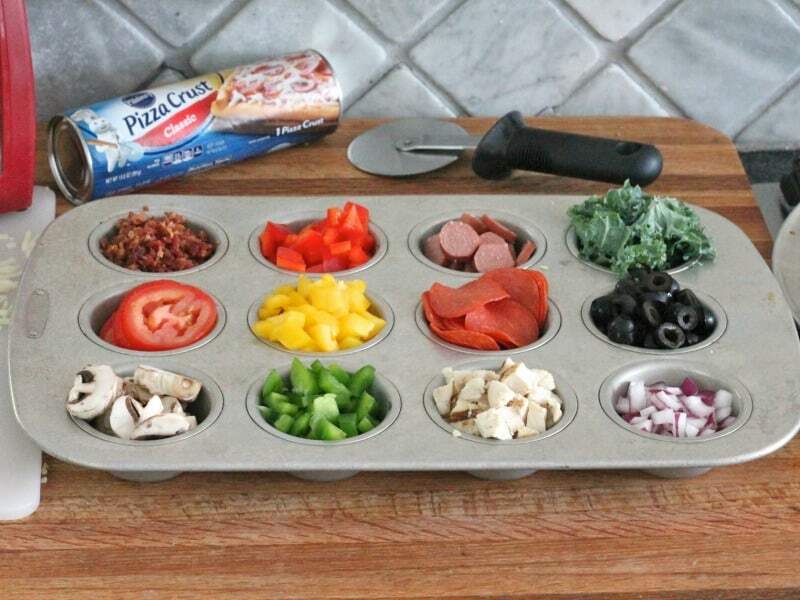 We use a 12-cup muffin pan to keep all of the toppings organized and it works great! 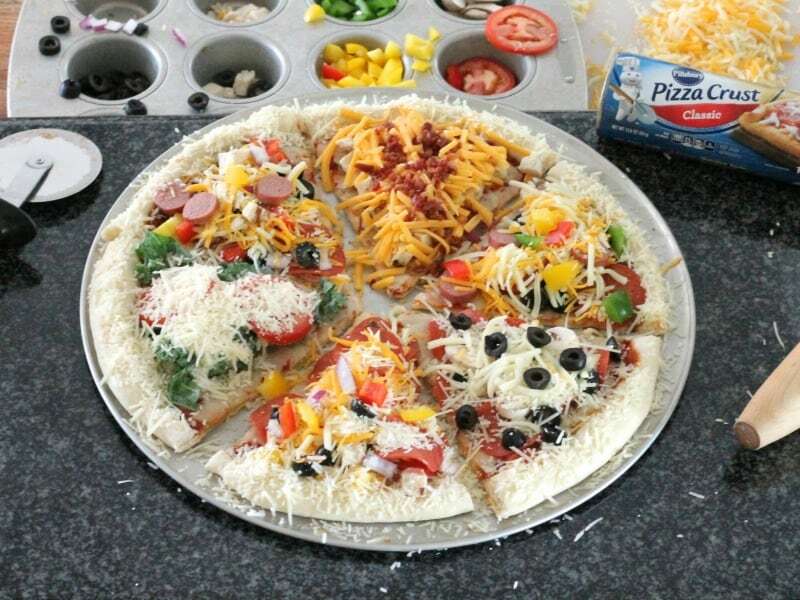 Give each person a slice of the prebaked pizza and start passing around the toppings. Everyone's slice will look and taste different. 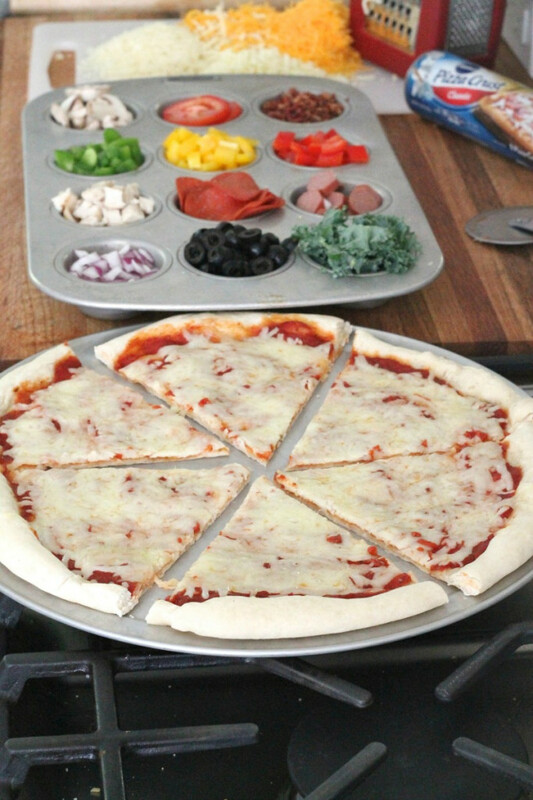 Place all of the slices back together in a round shape on your pizza pan. 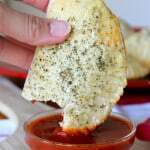 Brush the outer crust with melted butter and sprinkle all over with ¼ cup shredded Parmesan cheese. 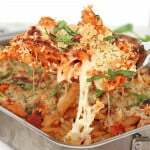 Bake for about 20 minutes longer or until cheeses are melted and crust is golden brown. Serve and enjoy! This is just too fun Meagan! Love seeing your sweet boys in the kitchen making their pizza! 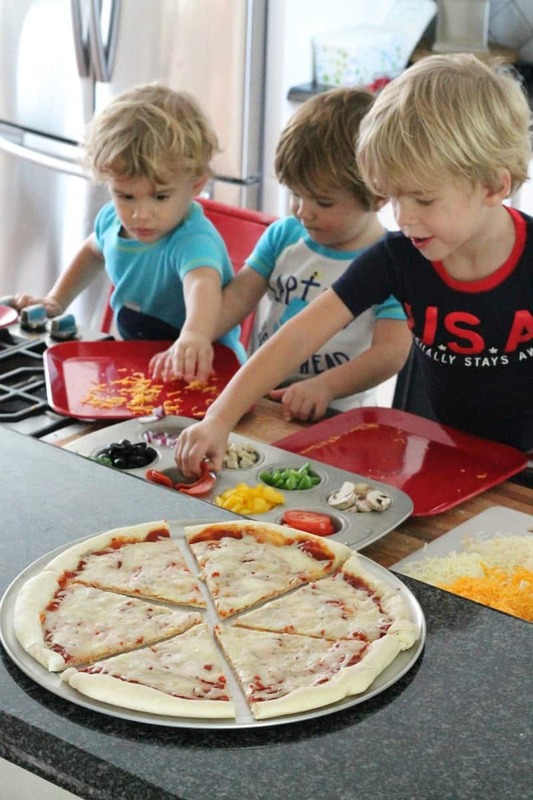 Everyone always wants their own pizza, so this is a perfect idea!! Your boys kill me!! And I want to come to pizza night at your house – how fun! Such a fun idea! I love that you put the toppings in a muffin tin. Creative! This is such a fun fun idea! Your boys are the cutest things ever. Whenever I think I’ve found a food that the whole family will eat without complaining I’m always wrong. Design a slice is the only way to go. Your boys are the cutest! It looks like they had a blast making dinner . Such a great idea to slice and create individual pizzas with less time and work! You are brilliant! What a fun dinner and tasty too! I love this so much! I love that you are in PJs and how happy you all look. Making your own slices and using the muffin tins for toppings is pure genius. Thanks for sharing this with us, Maegan!